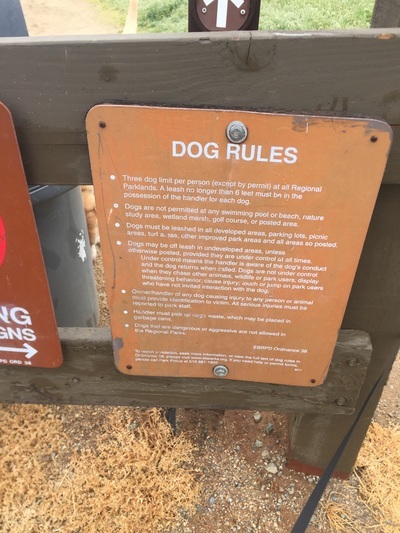 Dog Rules: Dogs allowed off-leash if under voice control in undeveloped areas. Bring a leash in case you encounter grazing cattle. 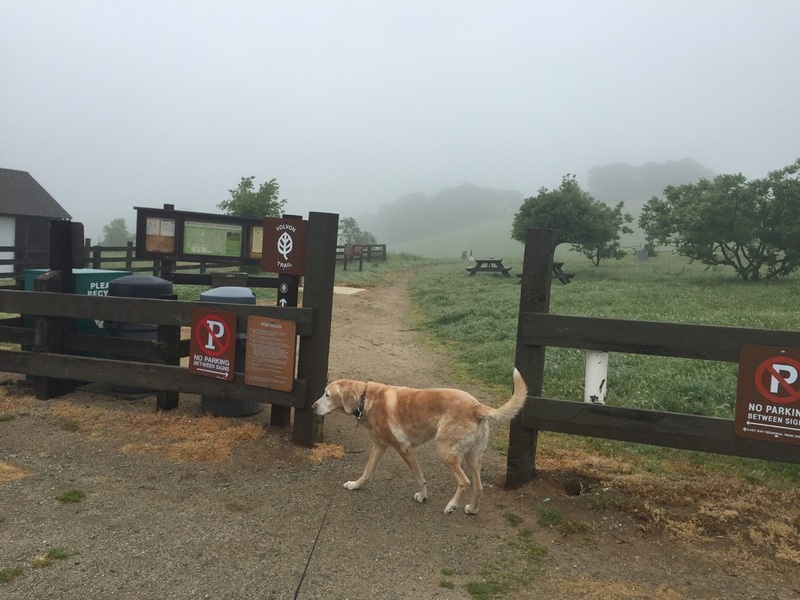 Best time to visit: Anytime except a very hot day. 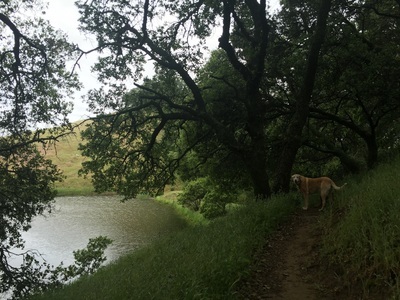 If it’s a hot day, stick to the shaded Coyote Trail. 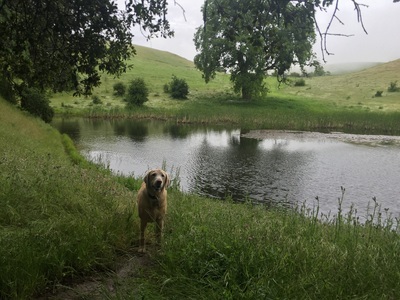 CAUTION: Do not let your dog drink from the streams or ponds, as there are warning signs that toxic blue-green algae are present in the water. 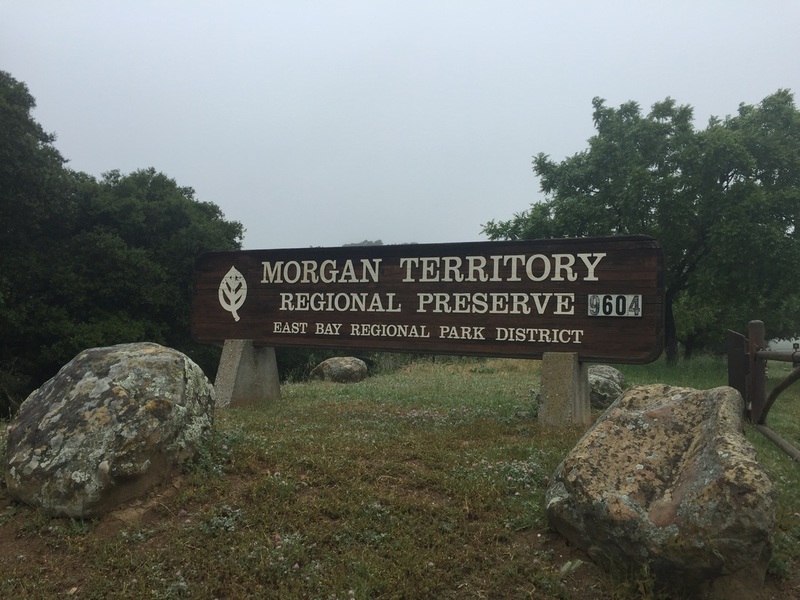 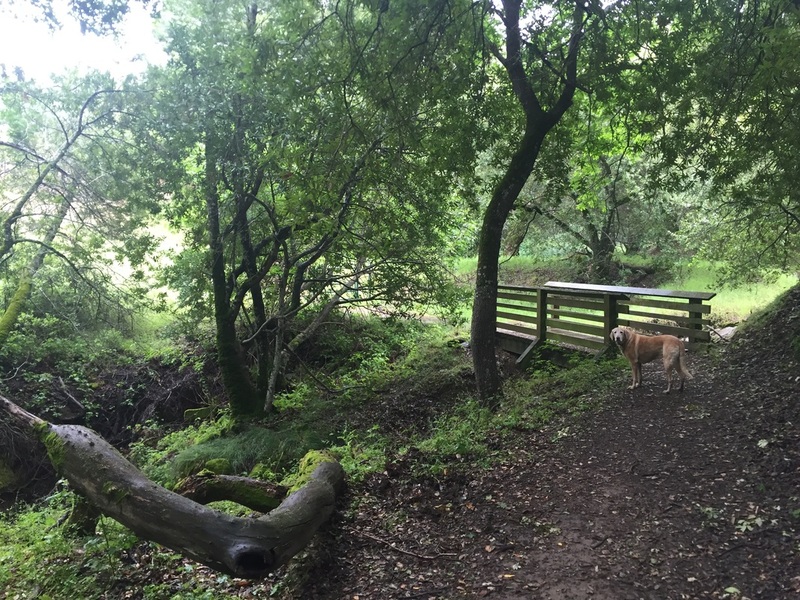 As of September 2016, poison oak has become overgrown on some trails. 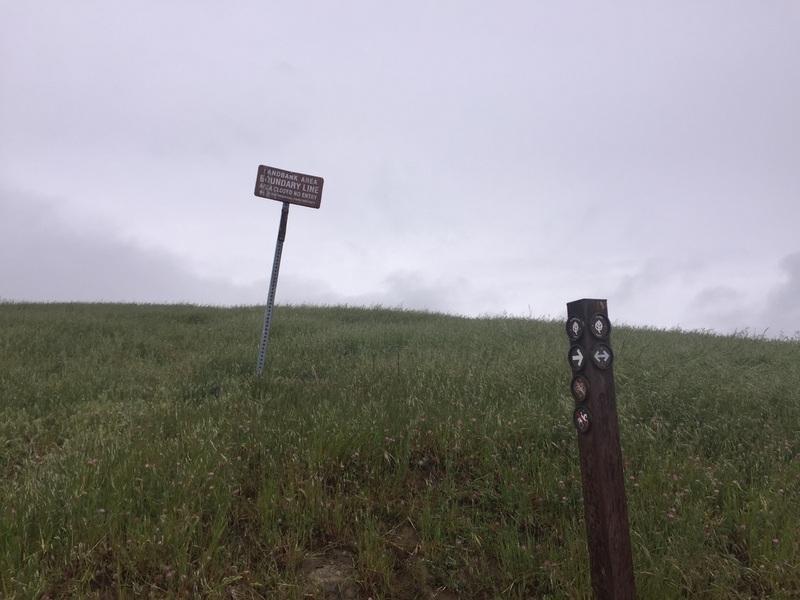 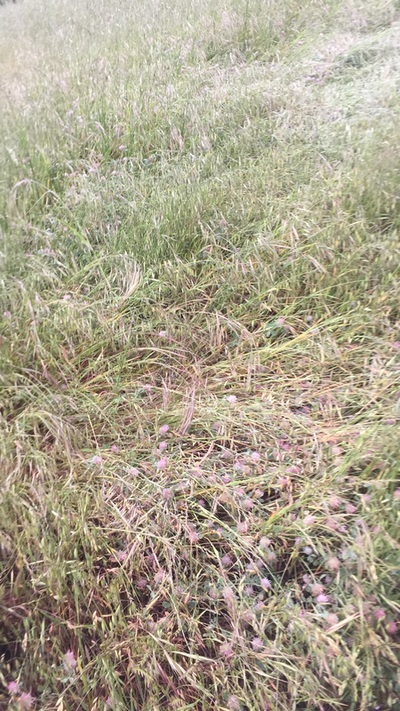 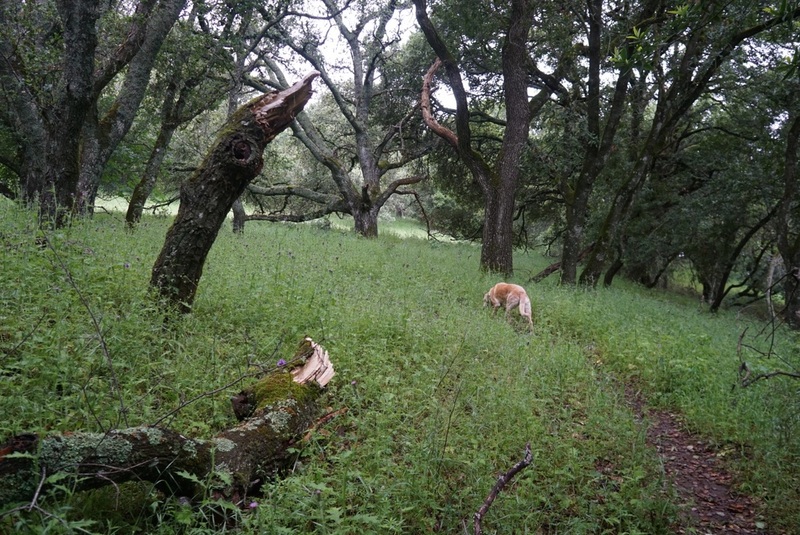 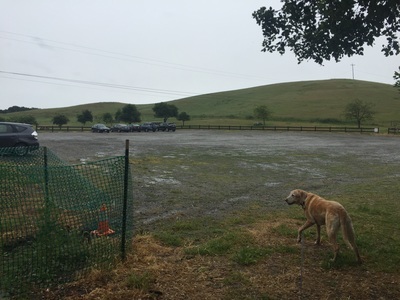 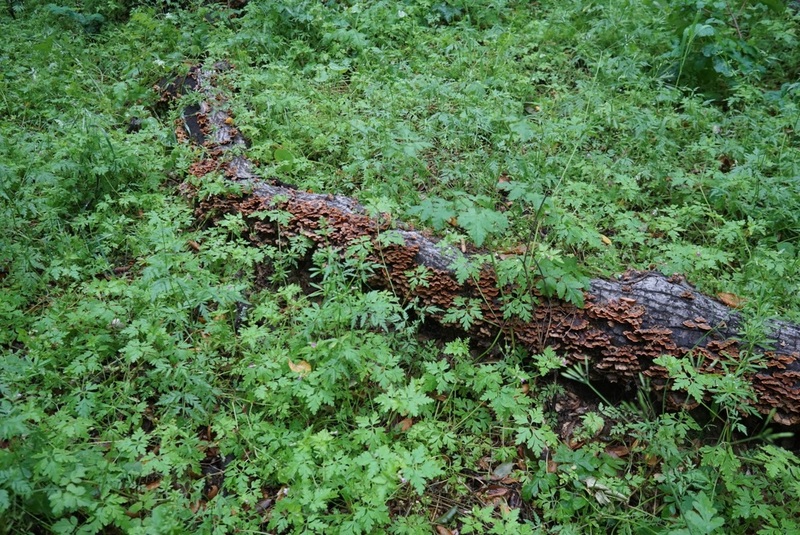 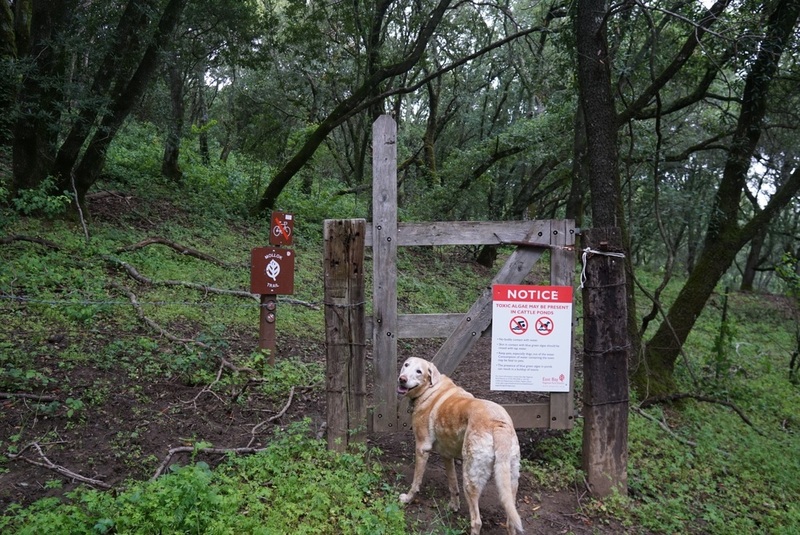 This happens every year, and the EBRPD has plans to perform trail maintenance. 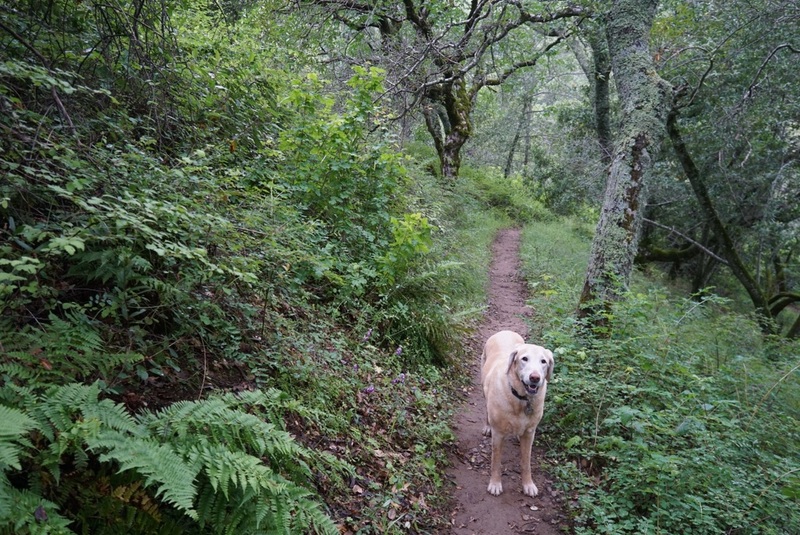 If you're concerned about it, I recommend keeping your dog on-leash on narrow, single-track trails. To reach the park: You will drive down a one-lane road for about 4.5 miles, but there's plenty of room for cars to pass on most of it. We went early and the last 2 miles were foggy with low visibility, so drive slowly and be cautious. 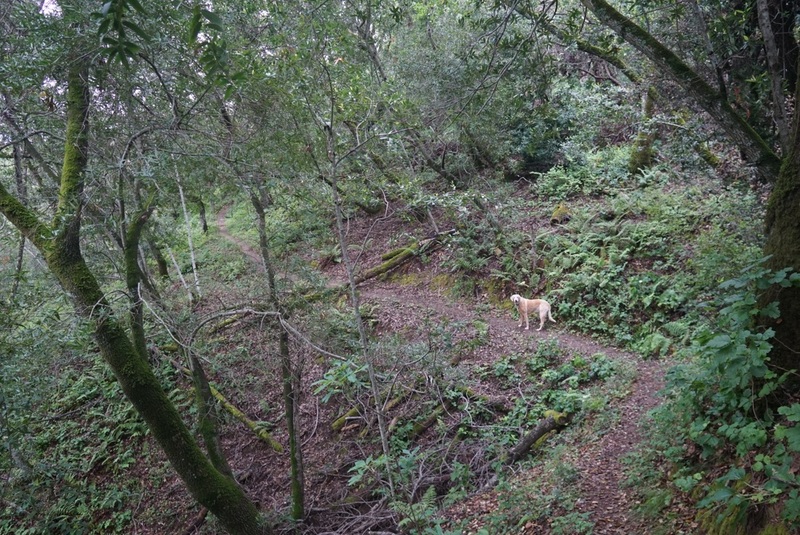 Watch for deer and cyclists coming around the bend. 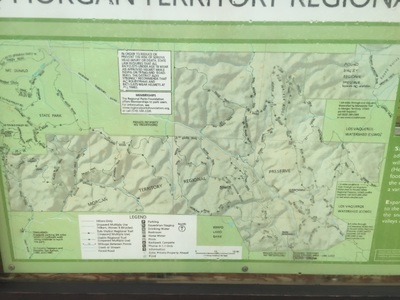 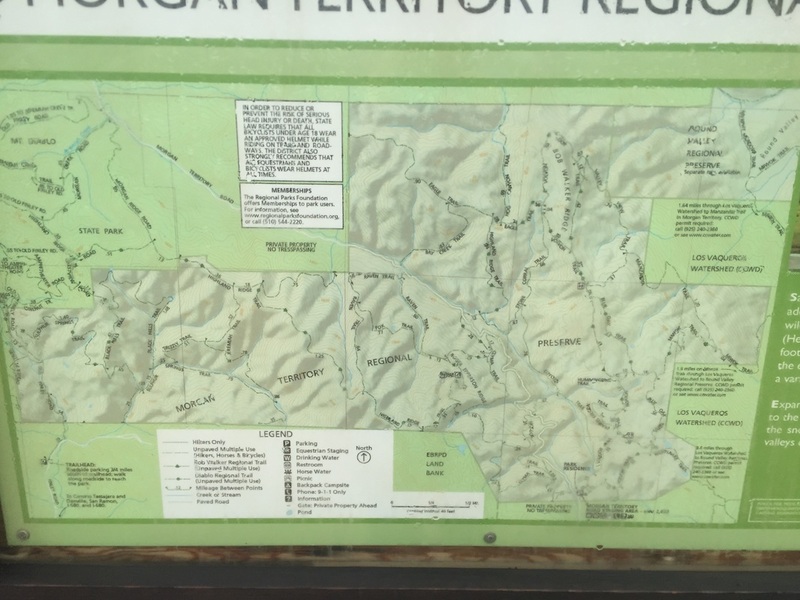 Description: This 4,708-acre park is a hidden gem with a lot to offer. 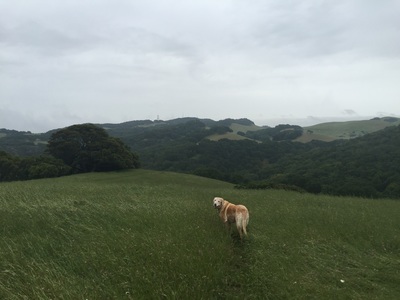 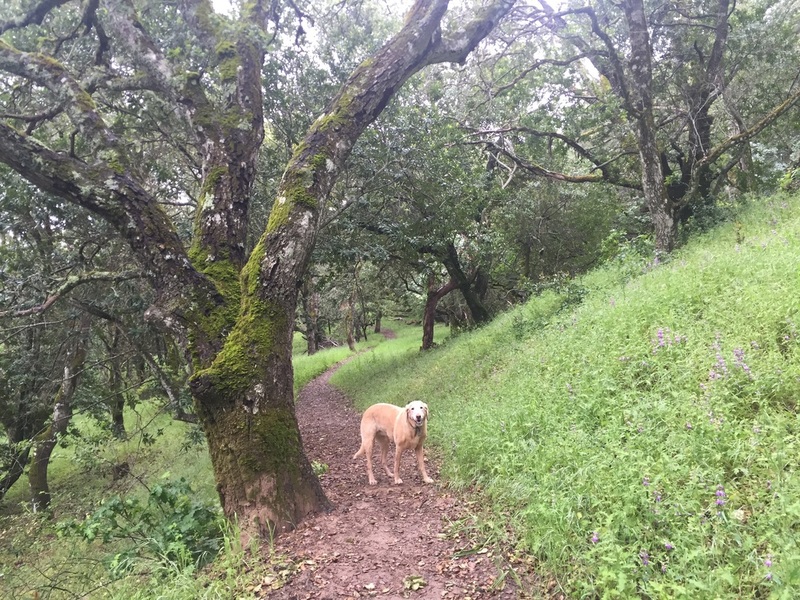 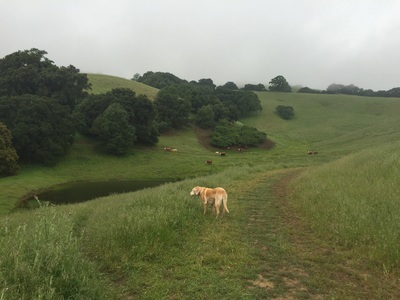 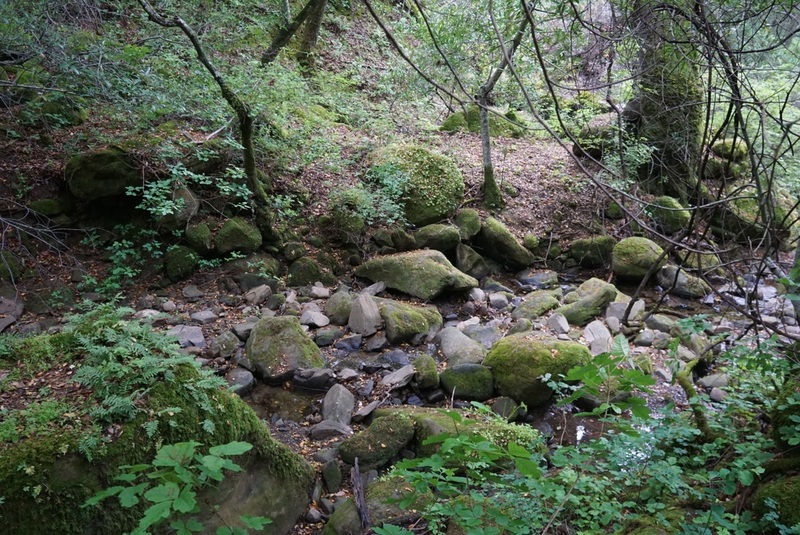 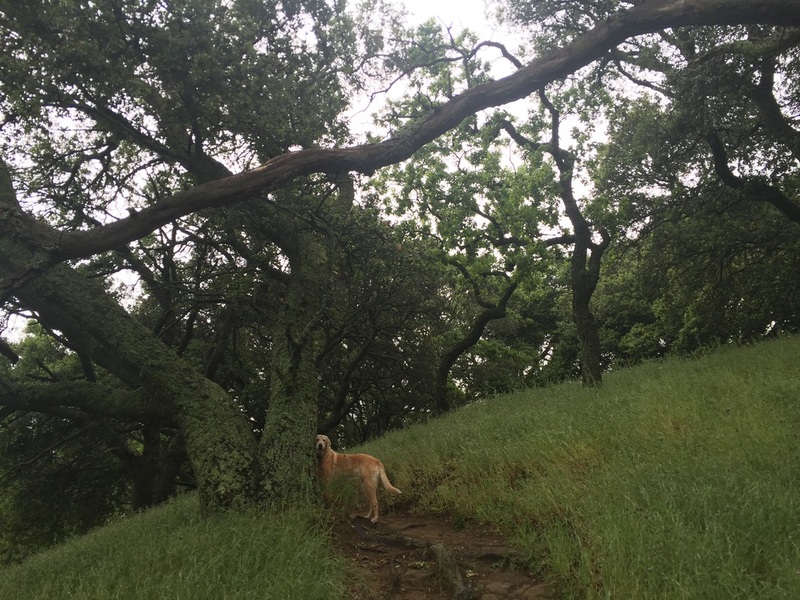 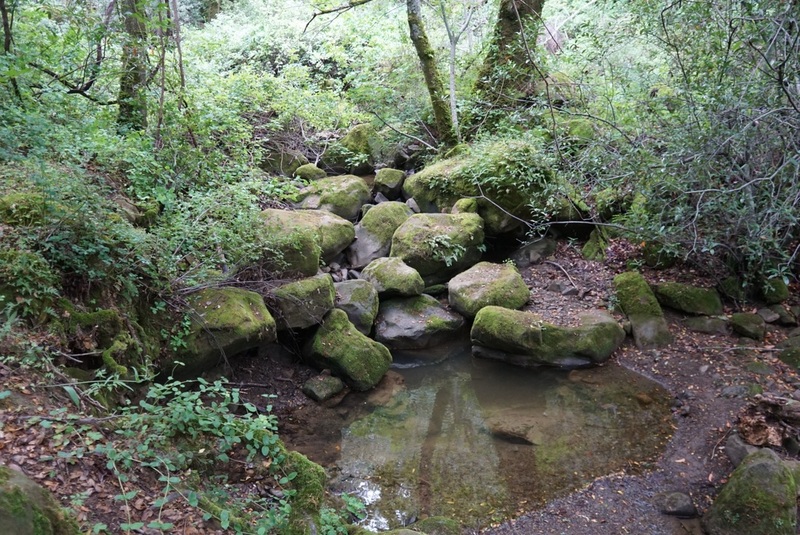 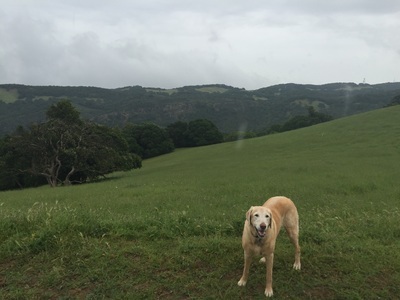 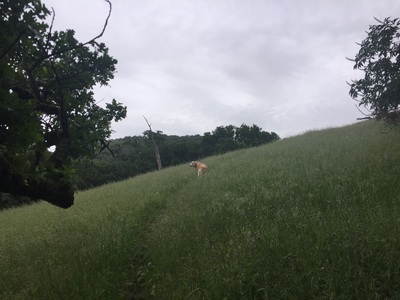 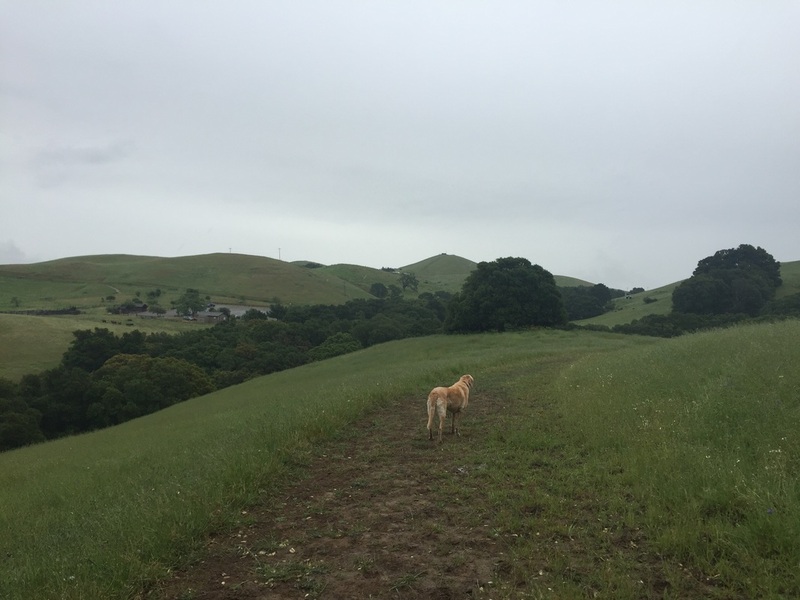 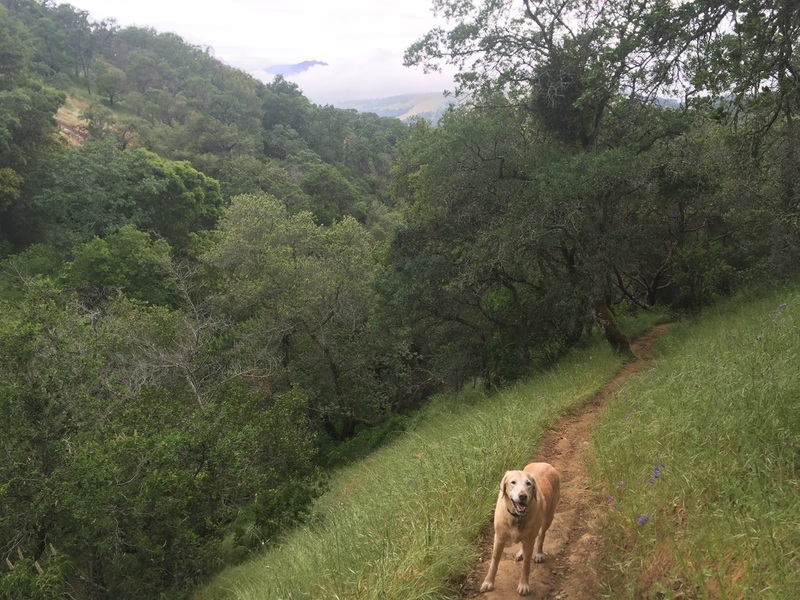 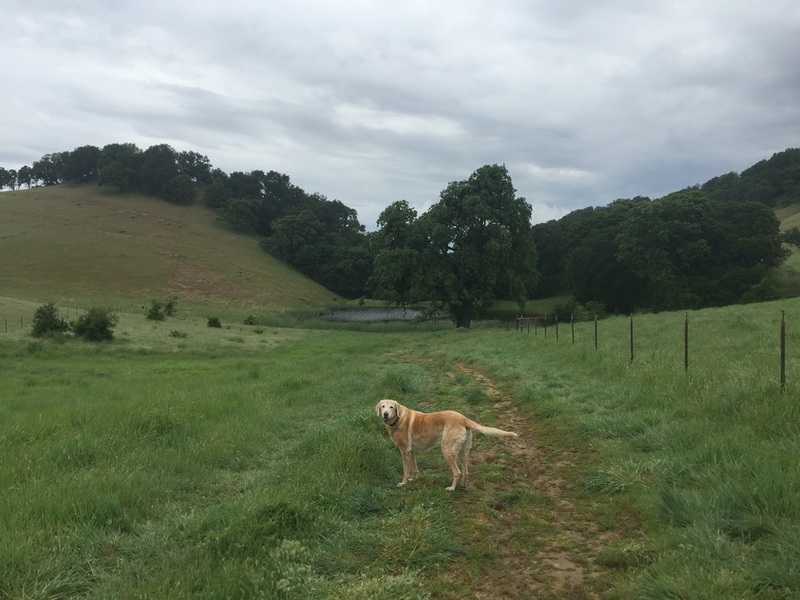 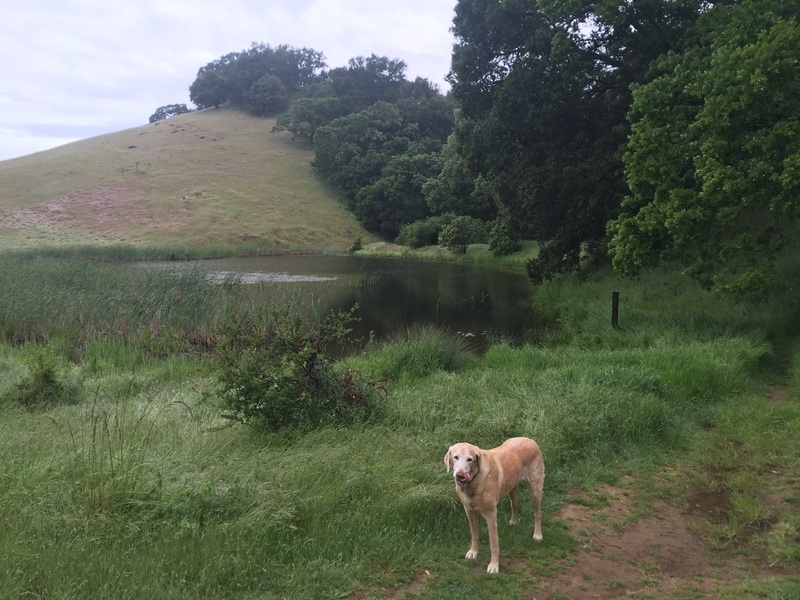 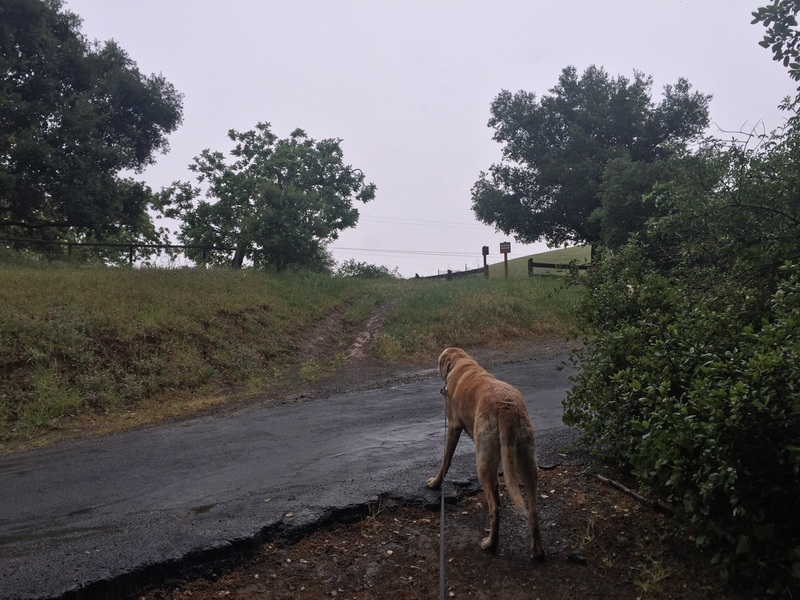 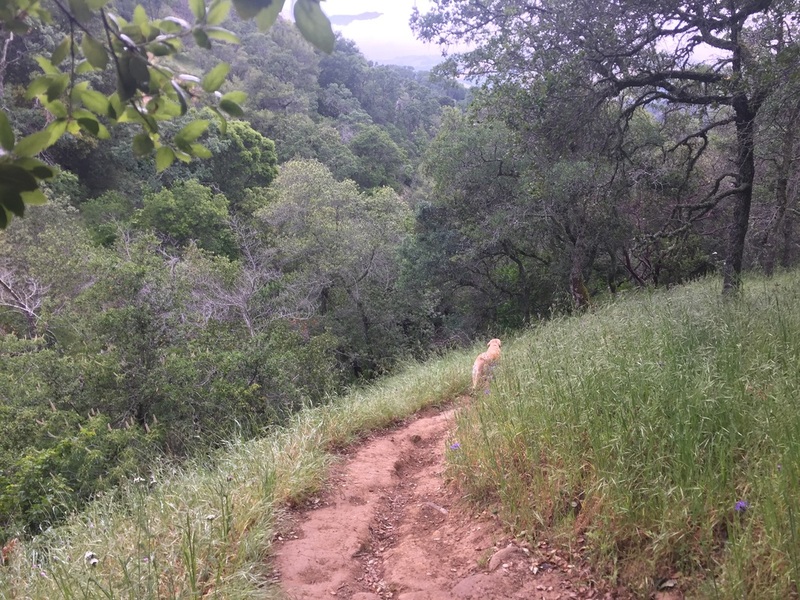 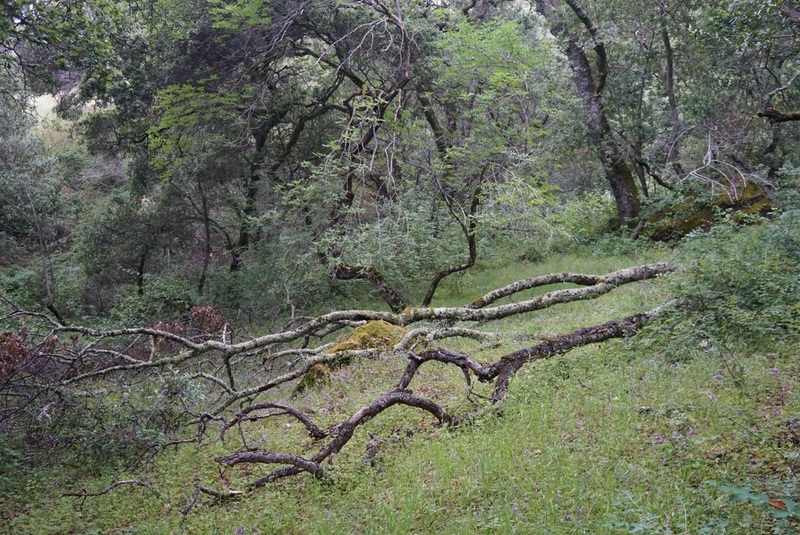 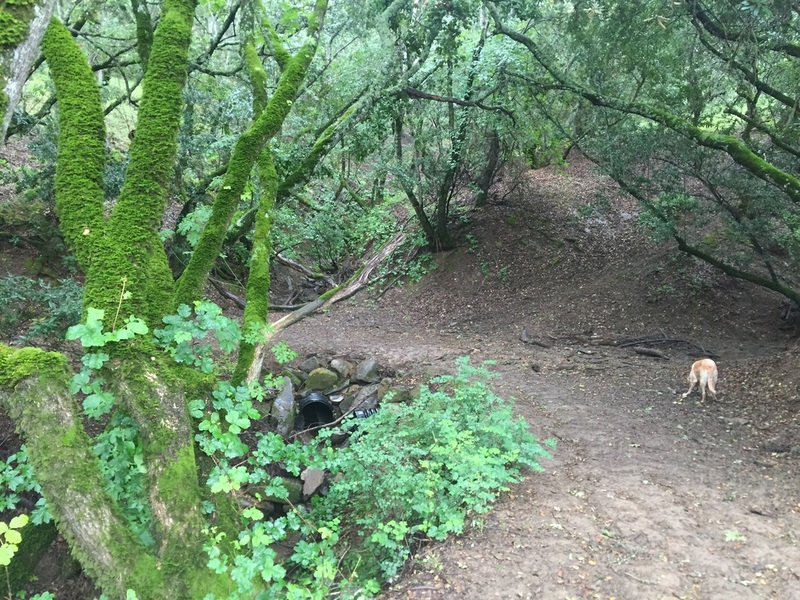 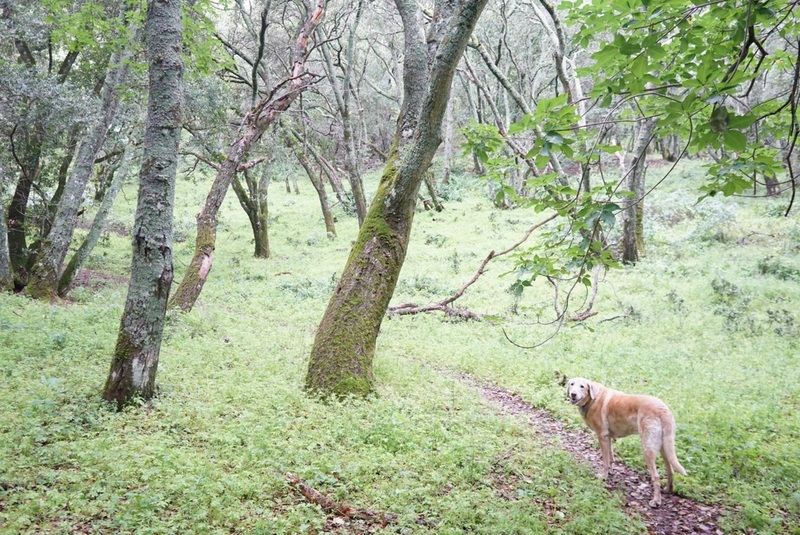 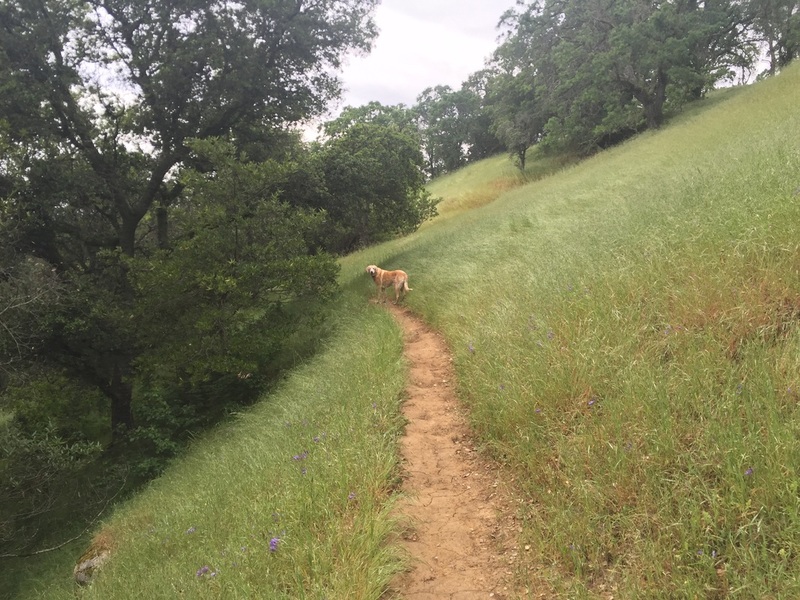 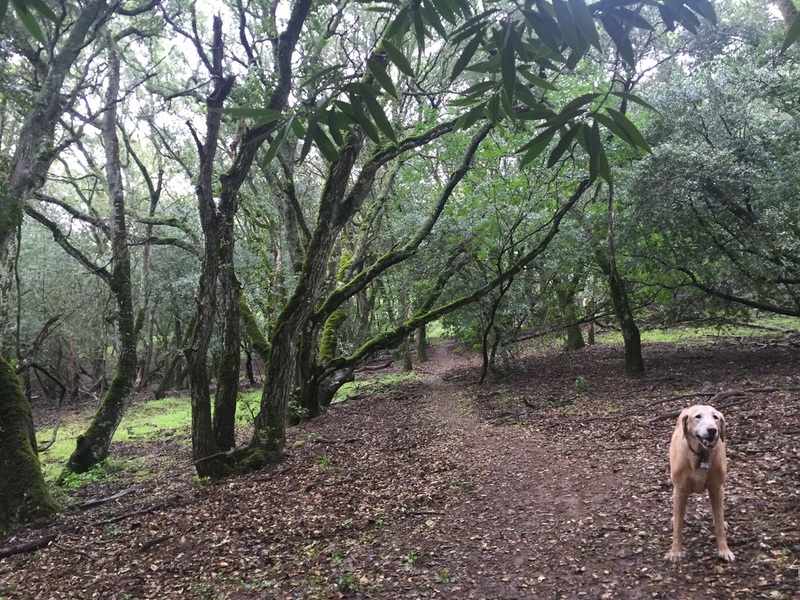 There are shady, moss-covered trails running along the creek, open meadows filled with wildflowers, and ridgetop views of Mount Diablo, St. Helena and the Sierras. 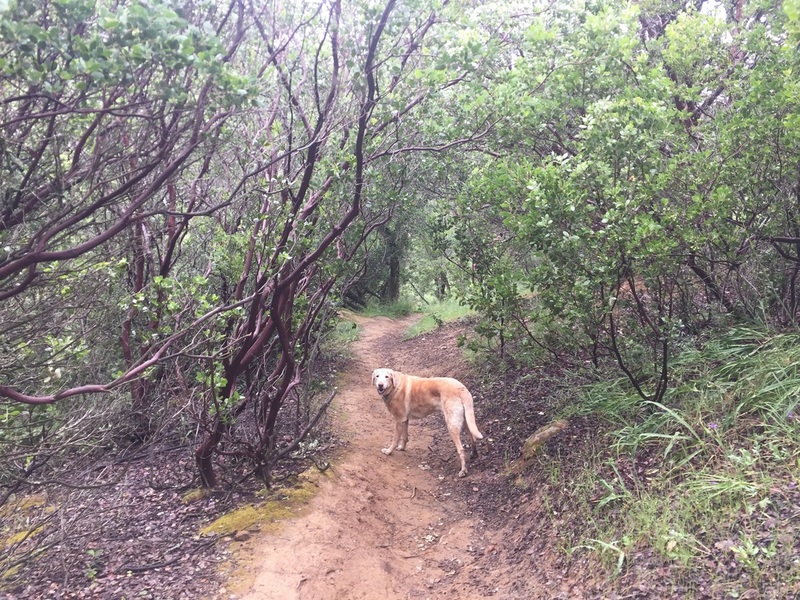 We started our hike on the Coyote Trail. 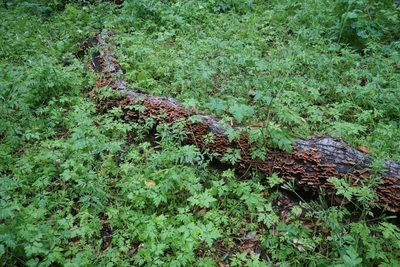 It snaked along a large pond and then through a forest running along the creek. The forest was lined with moss-covered boulders and gave it a magical feel. 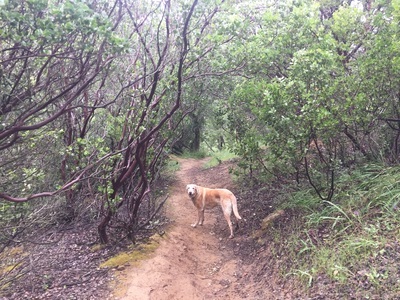 We then passed through a Manzanita forest and the trail began a slow descent. For a moment we got a glimpse through the trees of the hills and Mt. 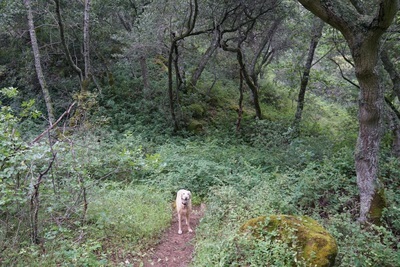 Diablo as the trail peeked out on the ridge. 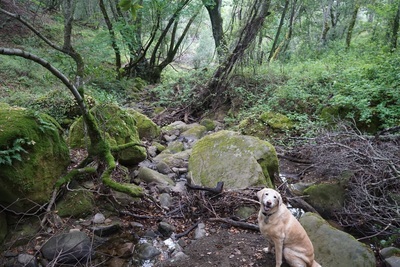 The trail continued its descent, began to follow more closely along the stream and we could hear the water gushing as we hiked. Soon we came to a trailhead at (0.68 miles). 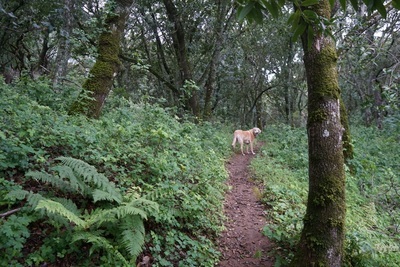 Go left at Mollok Trail. 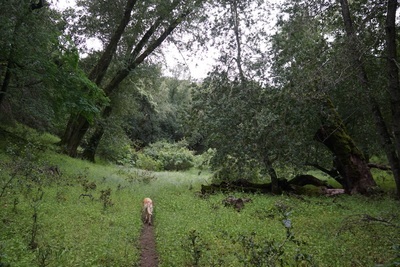 This will take you through a stretch of moss-covered trees with vines hanging above the creek. Cross the creek and continue on the trail. 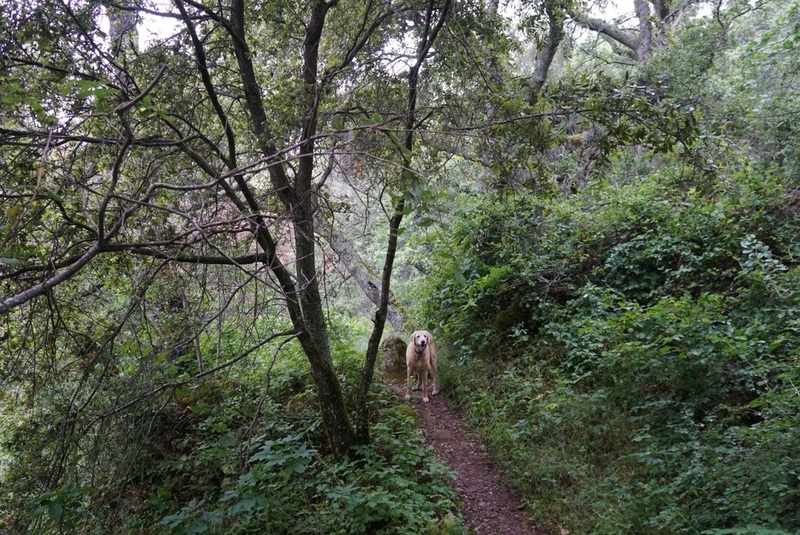 The trail begins climbing and a few hundred feet of the trail are overgrown with tall grass. Keep straight and you will see the trail begin again soon. 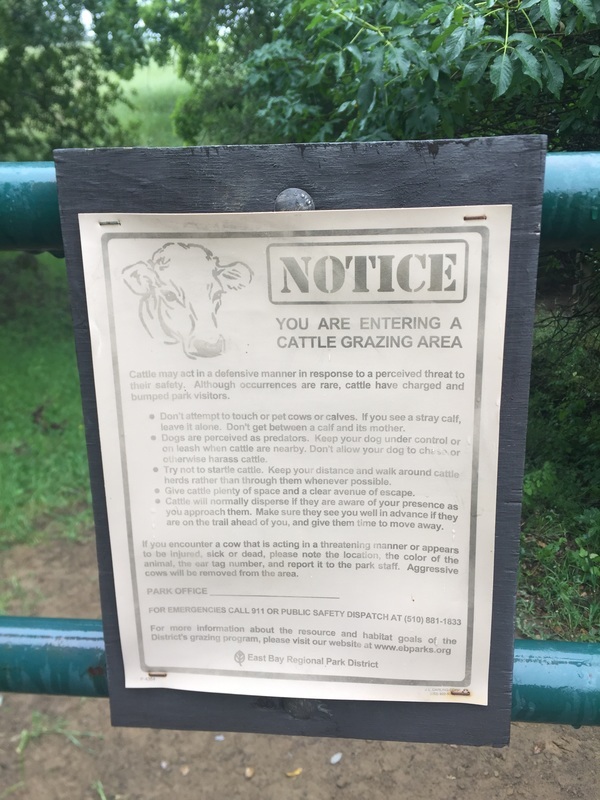 At 0.42 miles you will come to a cattle gate. Cross the road and continue on Mollok Trail. 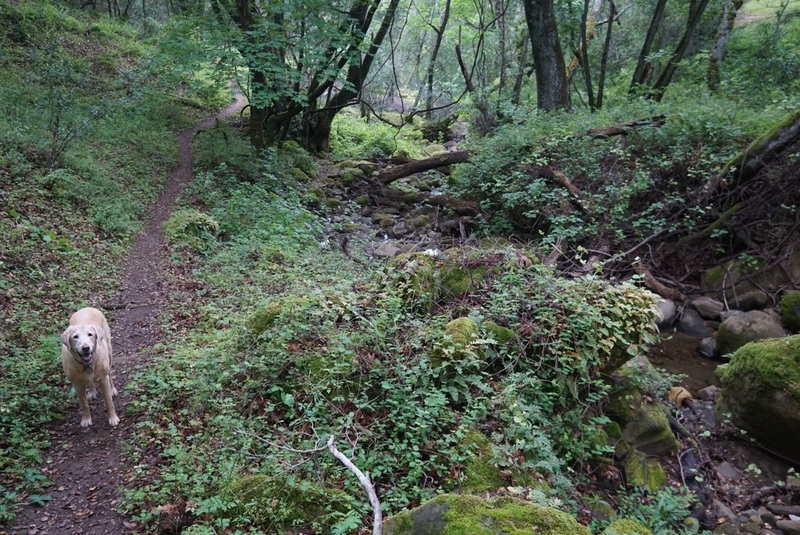 This trail climbs again, taking you through a dense forest. We saw deer feeding not too far from the trail. 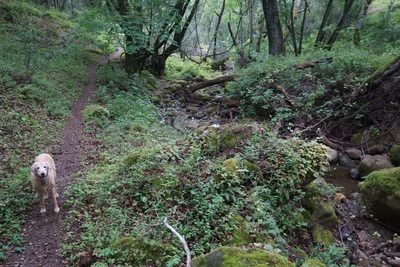 The trail will appear to split to the right via an unmarked trail, but disregard this and keep straight on the trail. At 0.26 miles the trail splits again. 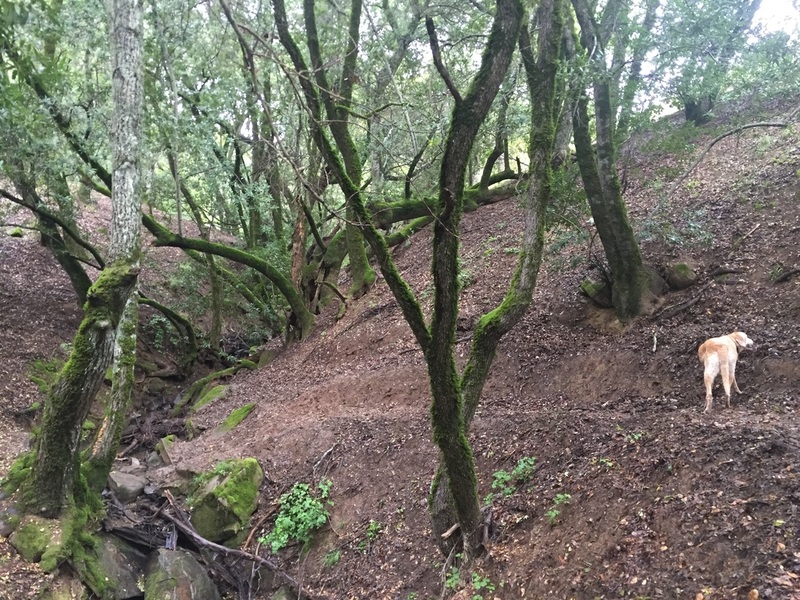 We took a right here and hiked up to the ridge on Clyma Trail. 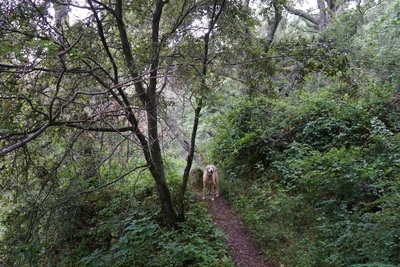 This trail was badly overgrown with high grass and we couldn’t see much of the trail. 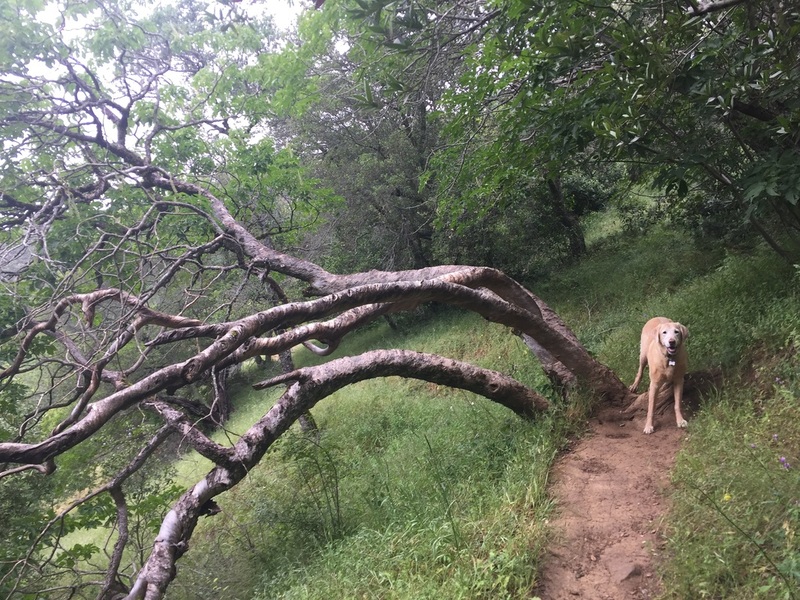 I wouldn’t recommend hiking this trail in summer because I can see the dry foxtail being a huge problem. 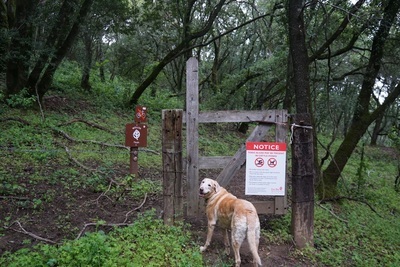 We came to another trailhead and the watershed boundary. We hiked left to the large pond on Clyma trail, but there was a large herd of cattle here blocking the trail, so we retraced our steps back down to the Mollok Trail. 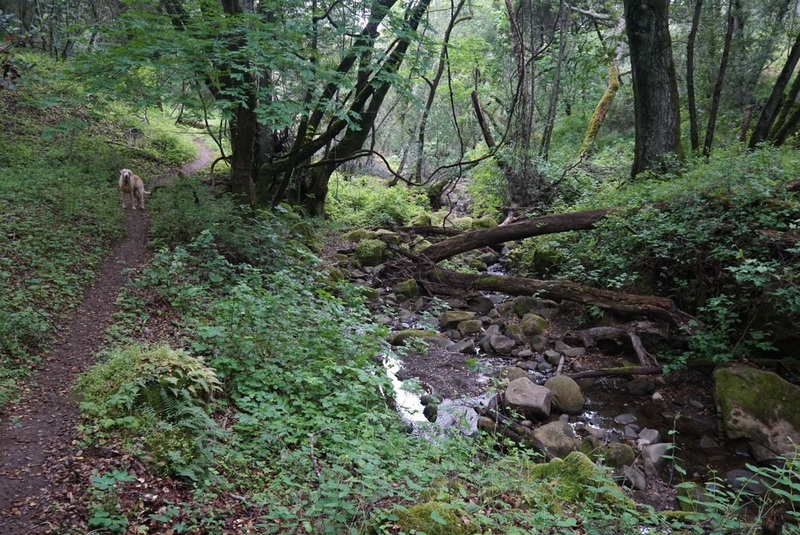 From here we hiked to the right on a trail that took us through the forest and across the stream, snaking up the hillside above the road. 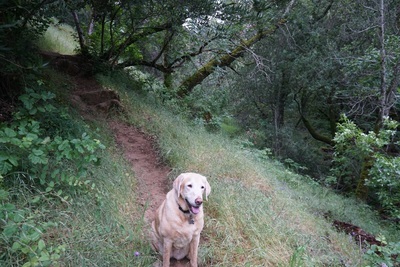 We came to a trailhead after 0.74 miles and continued straight on the trail. 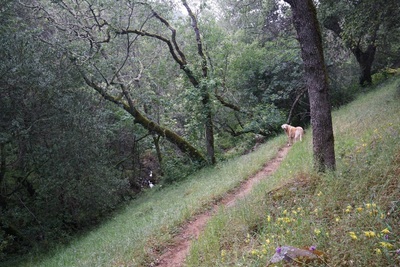 The trail below leads you to the street. 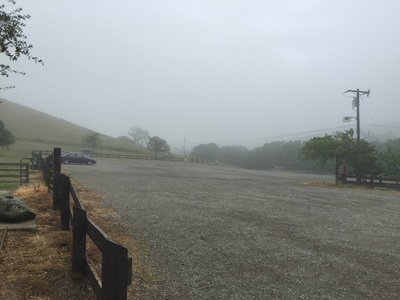 After a few hundred feet we came out on the hillside and could see the parking lot in the distance, but it is still 0.40 miles away. 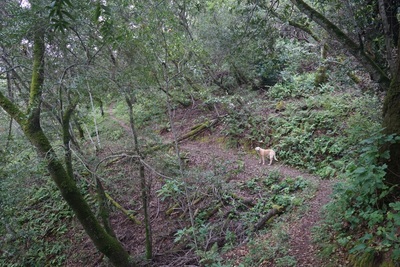 The trail snaked around a few bends, over the creek, and over a bridge. 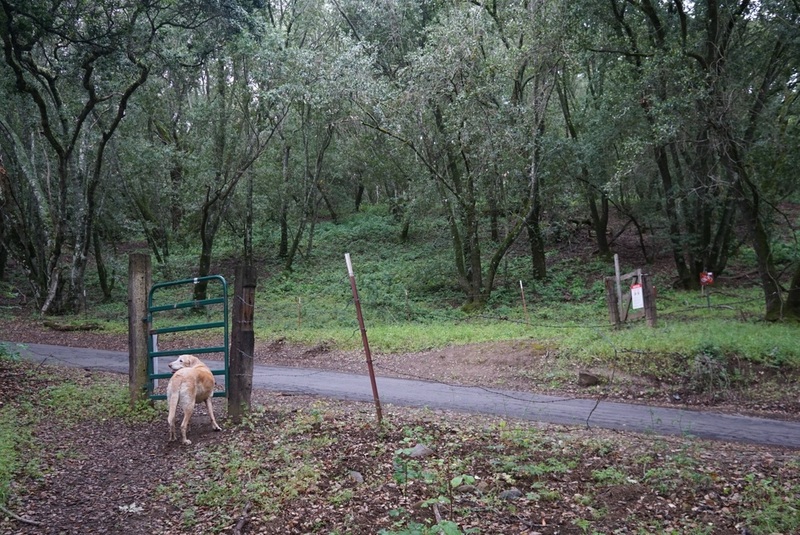 We came to a cattle gate, crossed the road and we were back at the parking lot. 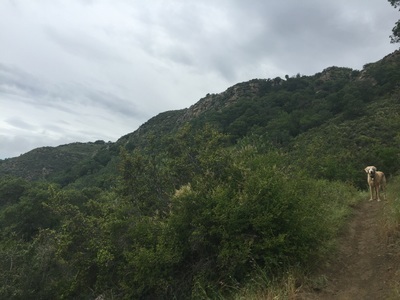 Overall the trail descended about 400ft and then climbed back up 600ft to reach a peak at 2,200ft. 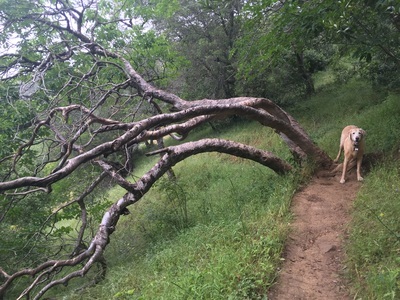 Our hike was just a little over 4 miles long. On your drive out look for the fresh strawberries being sold at the stand on Livermore Ave, before you reach the highway. 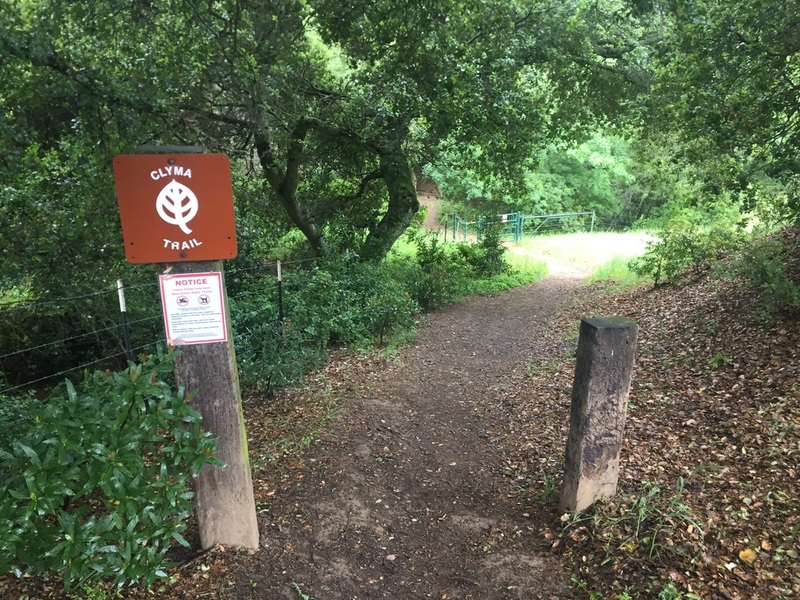 A note on poison oak: Poison oak is part of the natural habitat and is a native plant, so it is commonly found on trails. 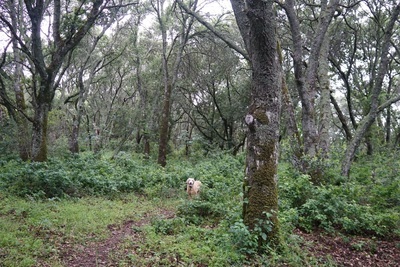 Throughout the year it can become overgrown in certain areas. 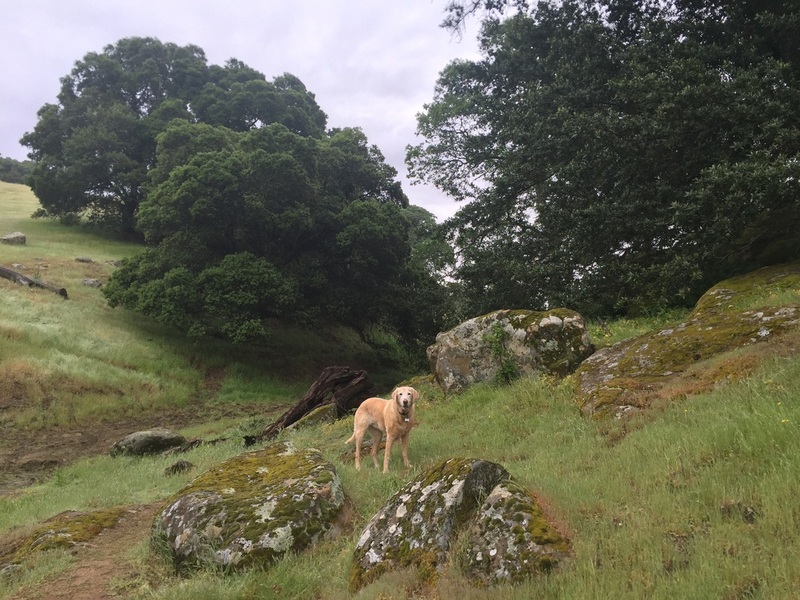 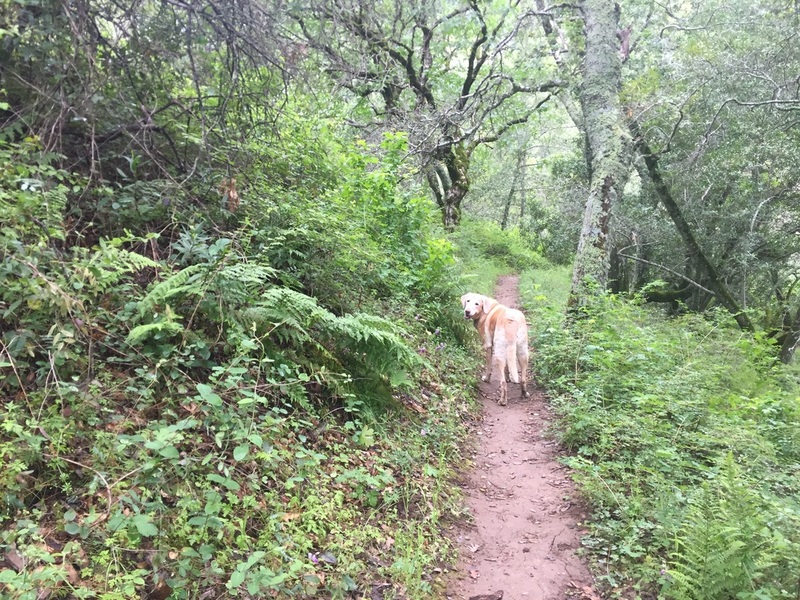 Luckily Bailey and I have not had any issues with poison oak, but some people are more allergic than others. 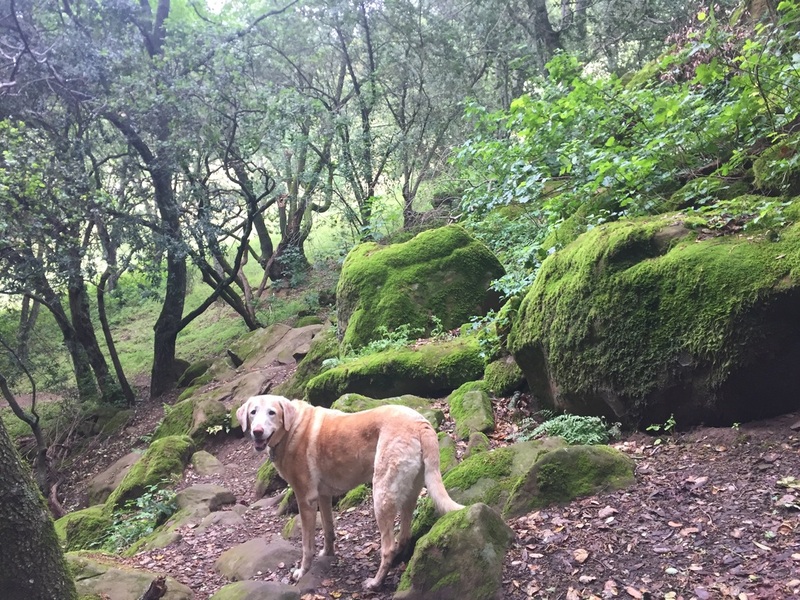 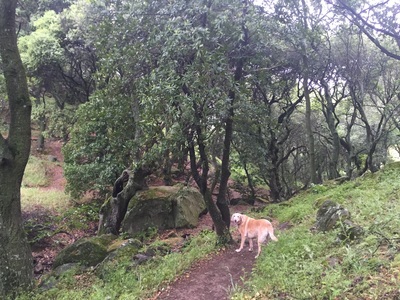 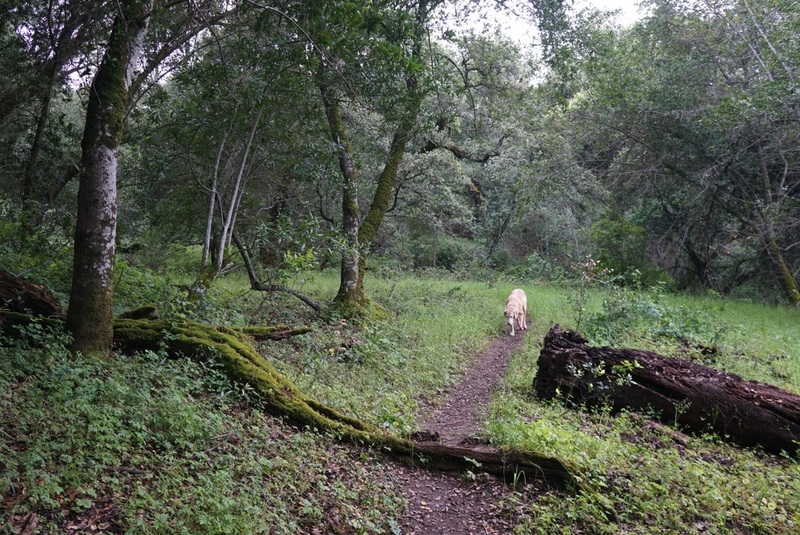 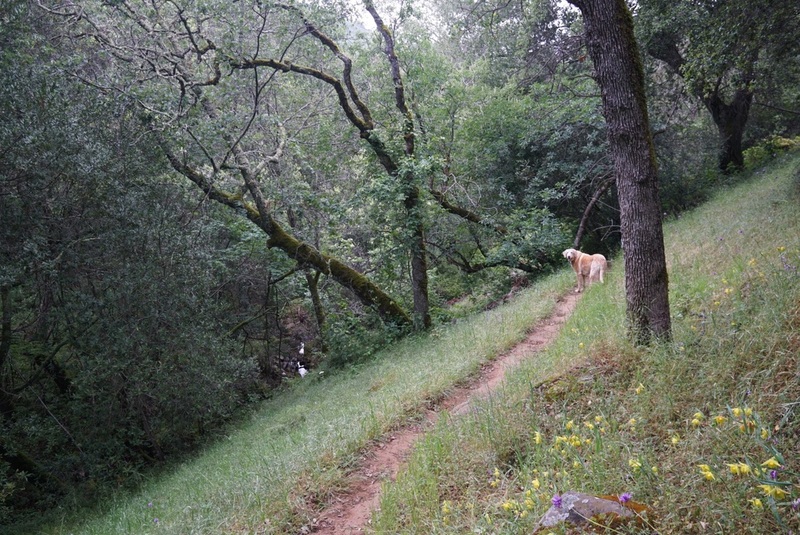 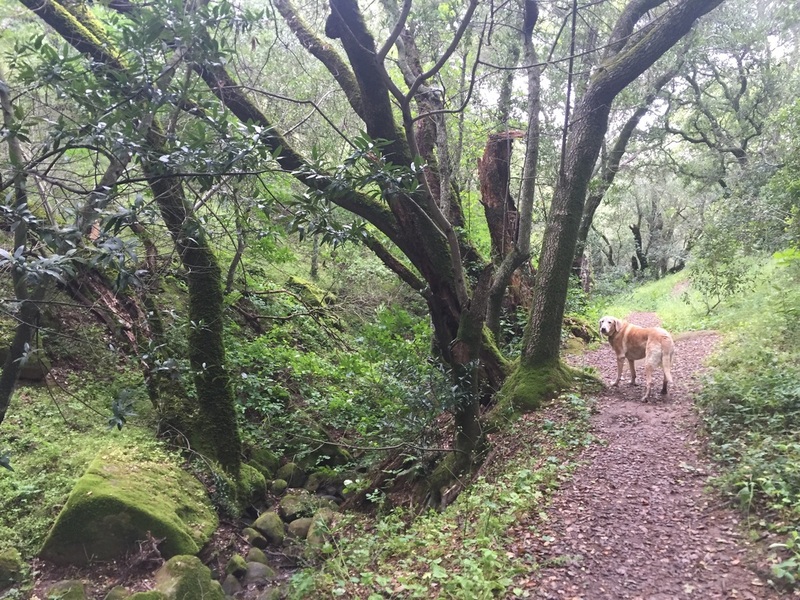 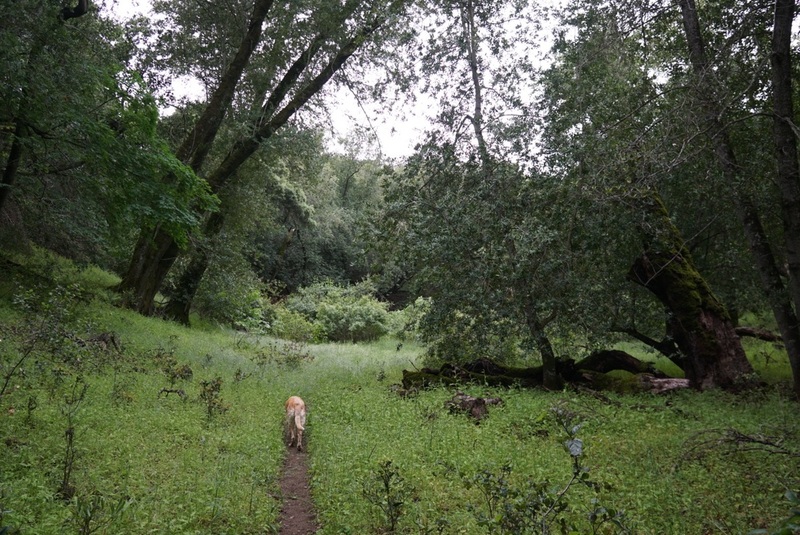 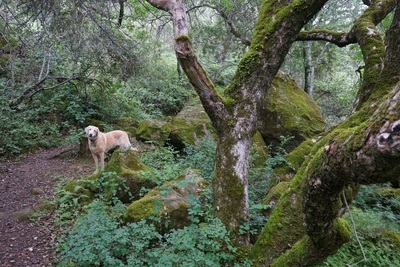 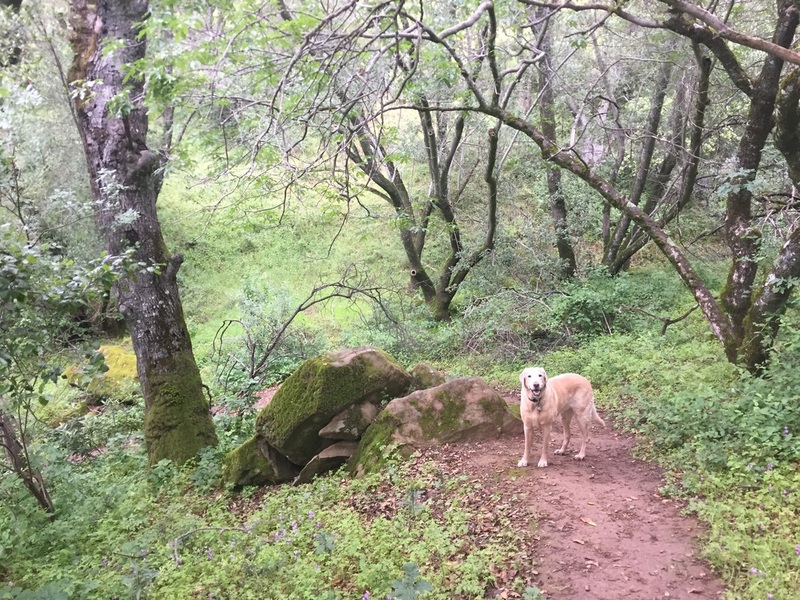 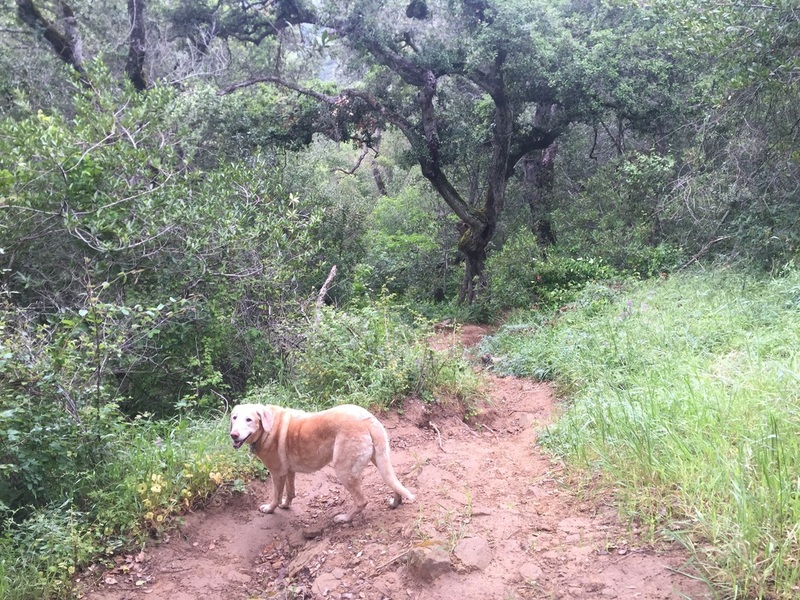 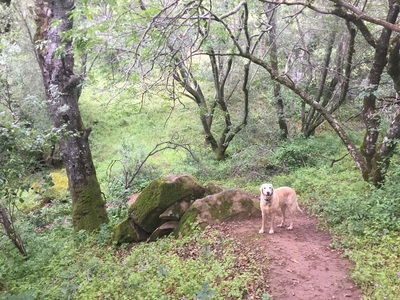 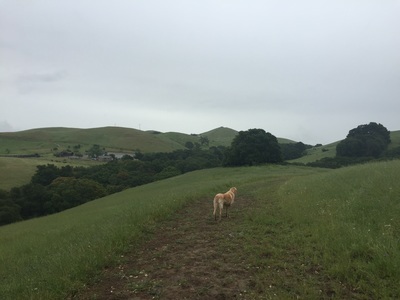 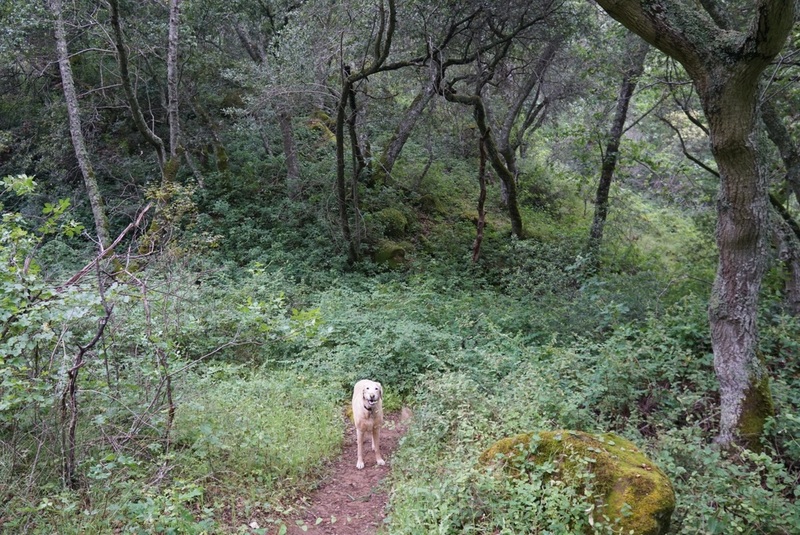 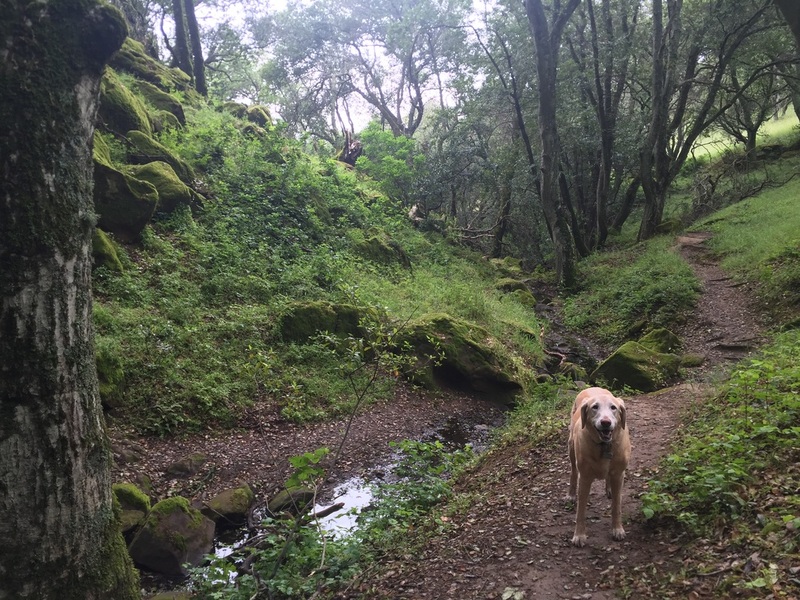 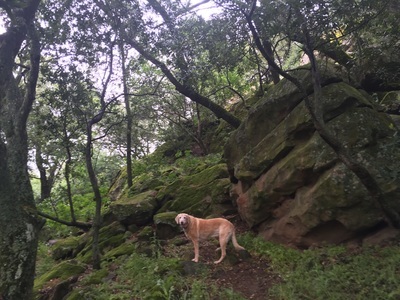 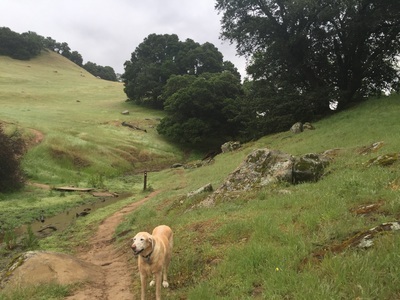 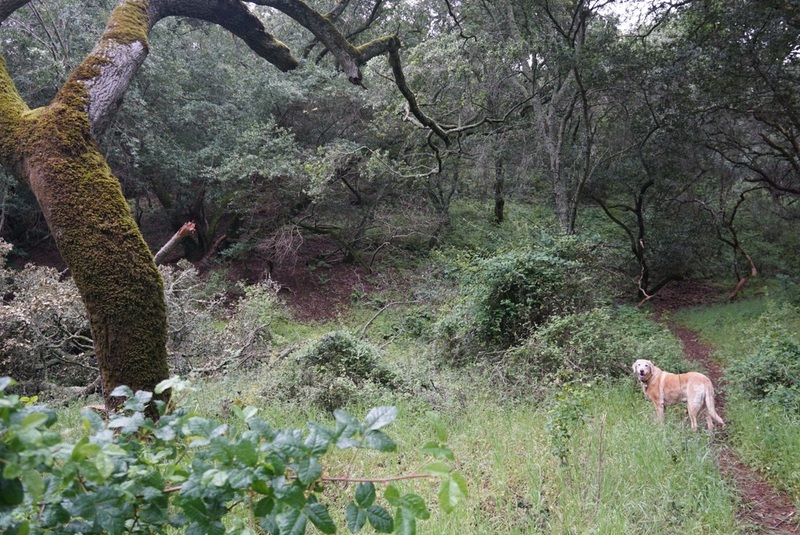 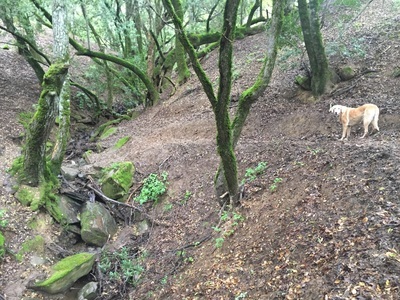 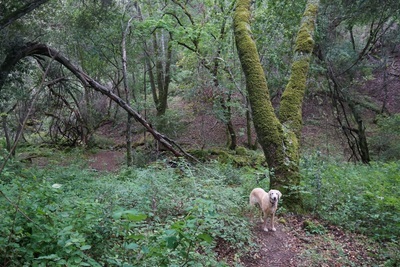 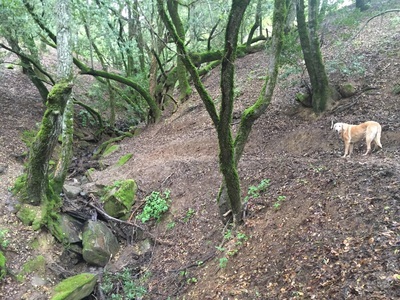 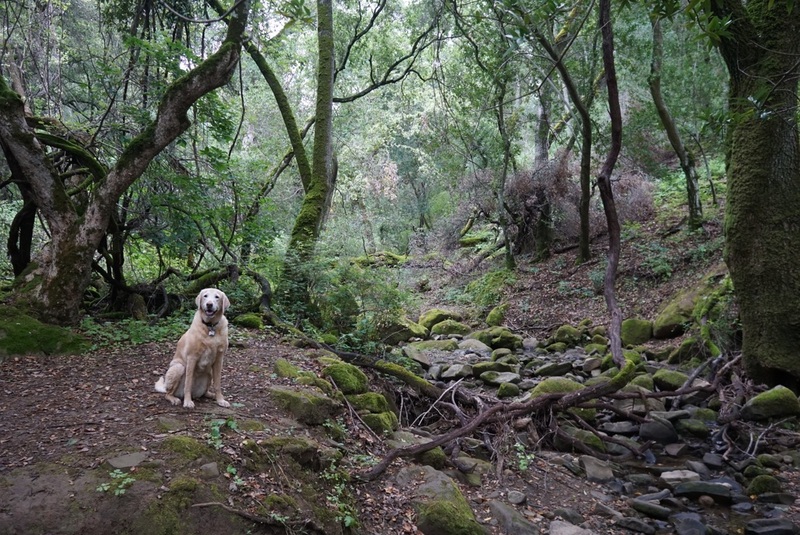 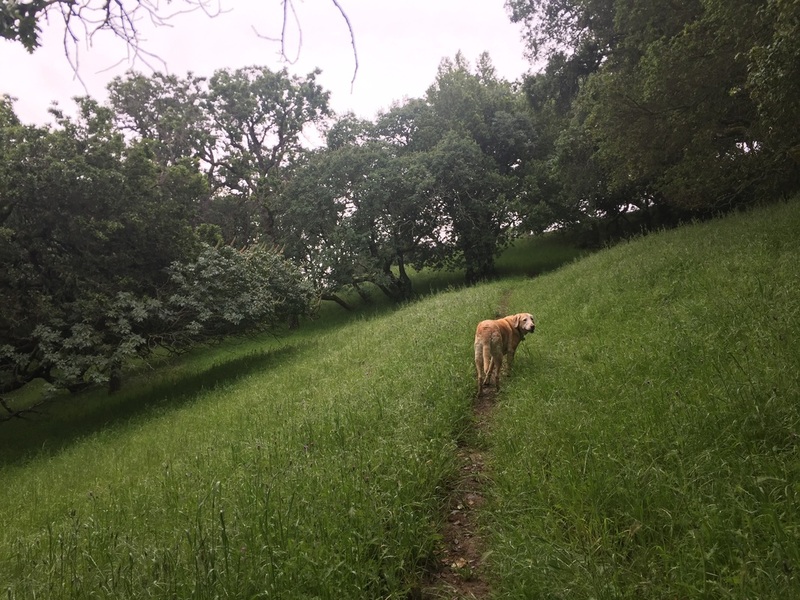 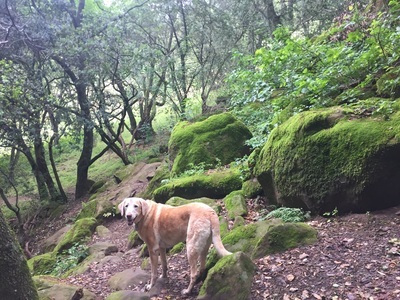 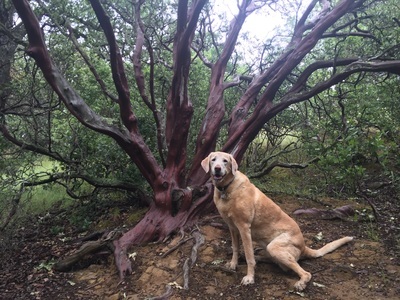 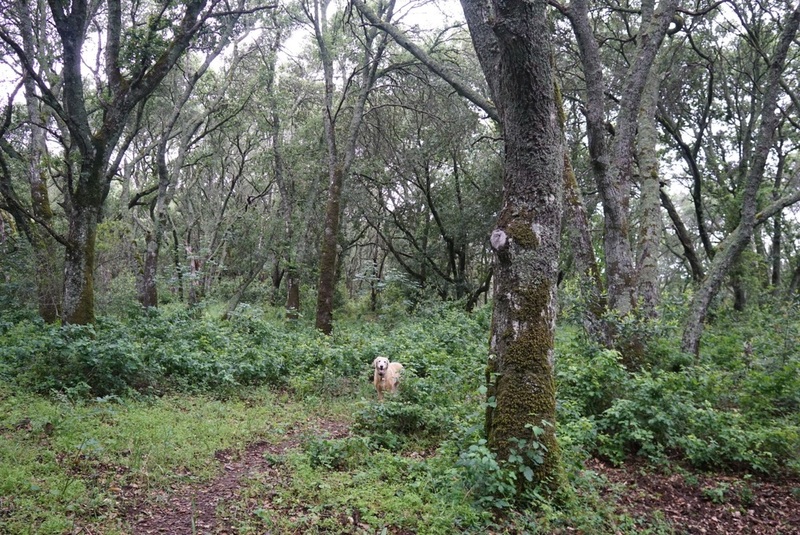 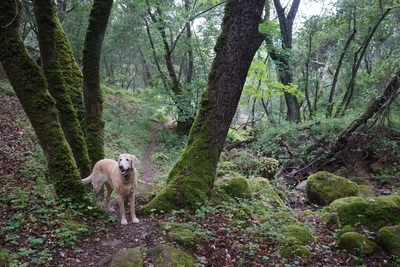 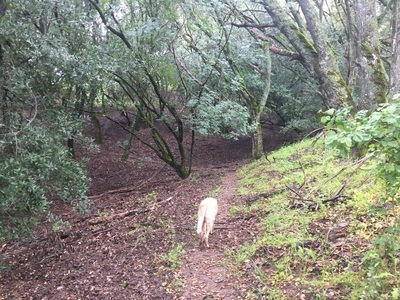 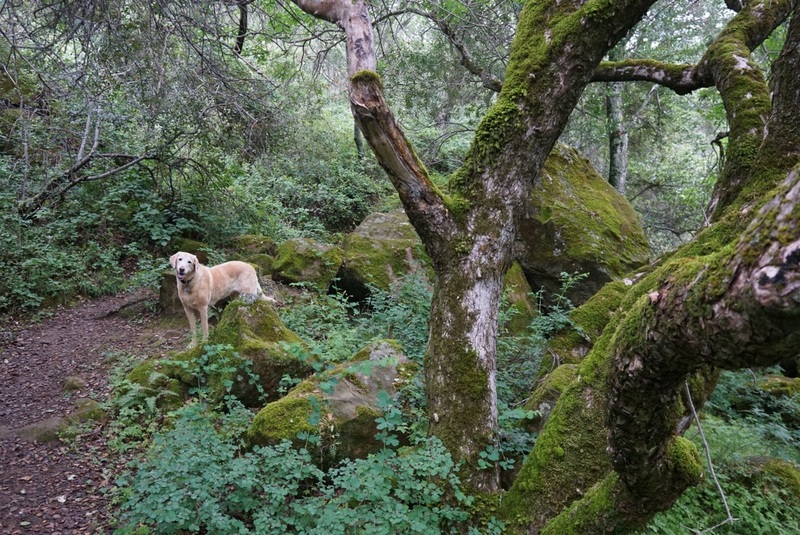 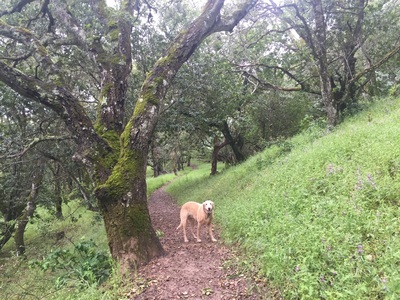 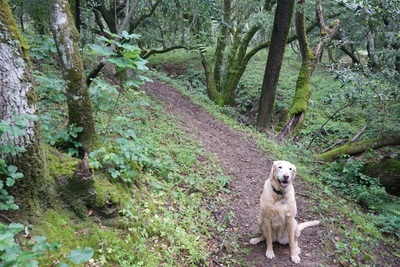 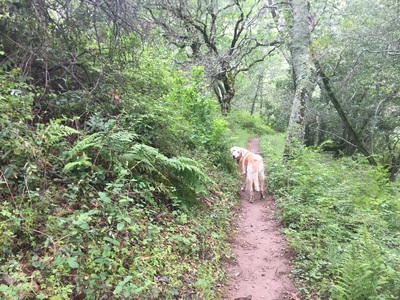 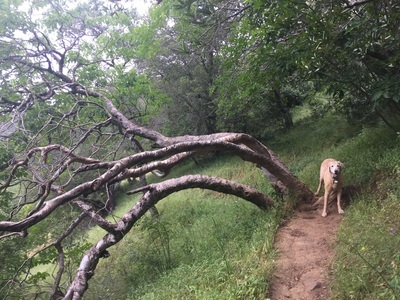 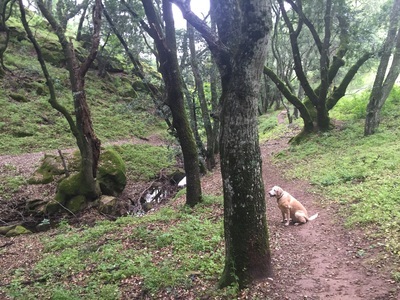 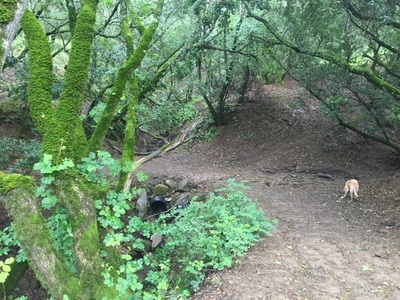 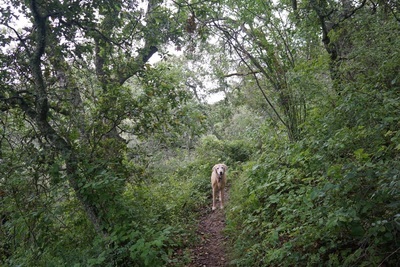 To help avoid exposure to poison oak I recommend keeping dogs on leash on narrow single track trails with dense vegetation (like the Clyma trail). If you are concerned about poison oak, it might be wise to call the park a day or two ahead and get an update on the poison oak situation. Always keep your dog visible, train your dog to stay on the designated trail and under voice control. Be alert, look ahead on the trail for anything unsafe, and use common sense. 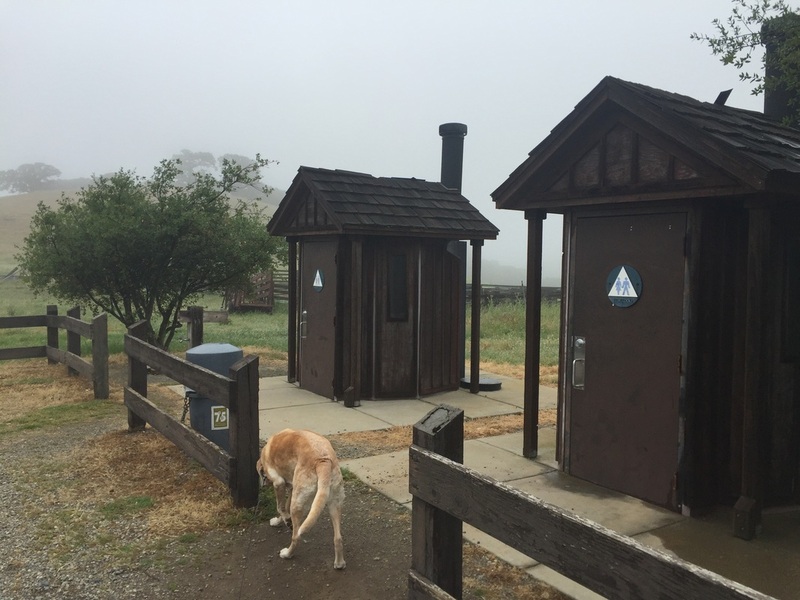 This park has 2 pit toilets, garbage cans and 2 water faucets near the parking lot.